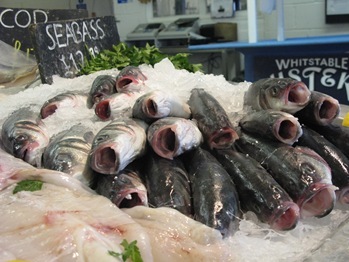 Last night I watched ‘Hugh’s Fish Fight’ on Channel 4 – where Hugh Fearnley Whittingtsall lifted the lid on the shocking state of the UK fishing industry. He interviewed fishermen on their boats around the UK who were furious at having to throw around HALF their catch overboard, also known as ‘discard’, to meet absurd and outdated government regulations. I was horrified – I knew the fishing industry was in dire straits, but I had no idea that BY LAW fishermen were forced to throw much of their catch overboard to meet certain quotas. What a disgusting waste of food. Not to mention the environmental havoc that this wreaks on the over-trawled oceans. It made for very powerful and compelling viewing – the fishermen, fishmongers and fish processors were all sickened by the laws which have been in place for many years, and many felt depressed and angry. Hugh looked as sickened as they did. It makes no sense whatsoever to have these quotas in place. Signed. It's just…just so STUPID. No other sodding country goes along with it, so why do we? Ah sadly I don't think we're alone in this – the ridiculous quota system is EU-wide and there are horrendous fishing practises all over the world. A very sorry state of affairs. I think Hugh FW is v brave to try and take on the evil Tesco in his cause for more sustainable tuna fishing – T are super evil in my opinion, in every aspect.